emotionally on canvas. 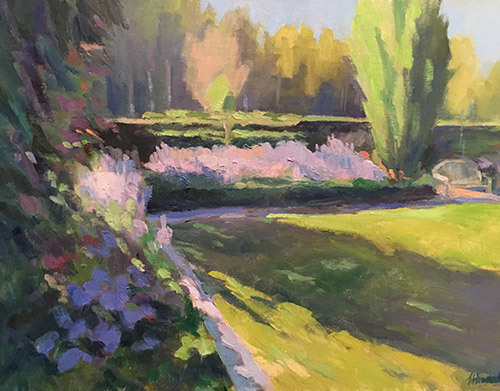 I strive to convey a textural quality to the surface with layers of color and an emphasis on capturing light. I have always loved to spend time outside and plein air painting has been a perfect match of painting in the moment and fulfilling my need to connect with nature and all its power. It gives me the space to dream and be inspired by life. Many of my current sources of inspiration come from the greater Washington, DC area but my love of nature started in my childhood in the Hudson Valley and many trips to the Adirondack Mountains of NY. I hold a BS in graphic design from SUNY College of Buffalo. I have studied at the University of Siena, Italy; Corcoran College of Art and Yellow Barn Studio. I continue to enjoy a long career in advertising and communications.